He has an unsurpassable sound with an ability and freedom that can only be boasted by the greatest trombonists in the world. He is a Principal in Spanish Radio Television Symphony Orchestra (OSRTVE). Ximo teaching at Escuela Superior de Música Katarina Gurska (Madrid) and Alicante Brass Academy. 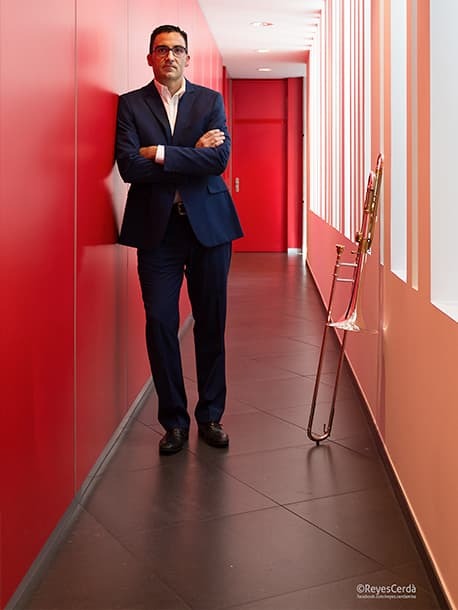 As a soloist, Ximo Vicedo has played with the Symphony Orchestra of RTVE, the National Youth Orchestra of Spain, Orchestre de Valencia, Orchestre du Prix de CSMDP, Orquesta de Valencia, Orquesta de Albacete, CSMA Symphony Wind Band, Barcelona, Santiago de Compostela, Bilbao and Madrid Wind Bands. On his passion about Pedagogy and Education, he has been invited regularly as professor to different Spanish youth orchestras and he gives master lessons and recitals all around Spain, Portugal, Italy, México, Colombia and China. His repertoire is wide and his professional experience is admired by many composers who, nowadays, create pieces to be played by Ximo. He has been a teacher at the Conservatorio Superior de Aragón from 2002 to 2013. In his curiosity about the investigation and technical innovation of the instrument, Ximo is an important co-worker in the trombones design, working with Don Vicente Honorato in the Stomvi Factory, he is committed to the investigation and development of the trombone, in order to offer the highest quality in the instruments production and to improve its execution. 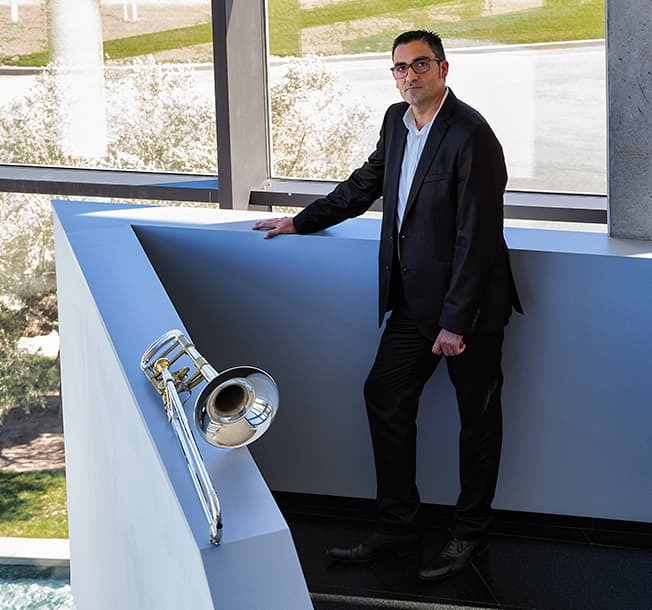 In March 2019 he will premiere the Double Concerto for trumpet, trombone and Orchestra by Christian Lindberg with the Spanish radio Television Symphony Orchestra (OSRTVE) in Madrid, written and dedicated piece for Ximo Vicedo and Pacho Flores that will be conducted by the composer. Ximo Vicedo’s work, talent and effort make him worthy of important awards, but his first CD as soloist “LO SOÑADO” is the highlight of many years of hard work and dedication that have led to his first album which can be summed up as “the sound of his dreams”. Ximo has been honored with two Silver Medals at the Global Music Awards for “LO SOÑADO” and “Ciutat de Castalla a les Belles Arts 2013 Award”.